The other day I mentioned that I continue to feel a degree of uneasiness when I leave Kate with the sitter. I also mentioned that this might simply have related to Kate’s mood last week and that I would be carefully observing this week to see if there might be more to it. I’m far from saying that I know what’s going on, but today was the third day in a row that she failed to display the kind of enthusiasm she has exhibited in the past. I had grown accustomed to her warmly greeting the sitter upon her arrival and also thanking her and saying goodbye when she leaves. She hasn’t responded this way for the past three visits. Kate has also changed in two other ways. First, she has been sleeping later. As a consequence, there has been much less time between the time she gets up and the arrival of the sitter. As her caregiver, I have felt it was a little bit abrupt to hand her off to the sitter when we had not spent much time together. I hasten to say that I don’t know that Kate feels the same way. It’s just that I have felt our spending some time together at Panera has been a good way for her to fully wake up and enjoy the day. When I wake up, I am ready to go. Kate has always liked a little time with very little talking before she is ready for the day. The second change is that she hasn’t wanted to spend much time with the sitter at Panera. Last Wednesday and today, the sitter met us at Panera because we had arrived so late. In both instances, the sitter told me that Kate hadn’t wanted to stay long after I had left. Neither did she express an interest in going back later. This past Friday they didn’t go to Panera at all. The sitter told me she had suggested it, but Kate had not wanted to go. This is quite a change from the past. Upon the arrival of the sitter, I have often mentioned that they could go to Panera if they wanted, and Kate has been excited and wanted to go immediately. I should add that after the sitter has left, she has been ready to go to either Panera or Barnes & Noble. That leads me to believe they are both still appealing places for her to spend some time. These changes do not cause me to think about changing sitters. These are the same ones who have been coming for six months, and Kate has liked them. It does, however, make it harder on me when I leave. It’s a quiet Sunday morning. I’ve had breakfast and my morning walk. As always, Kate is still asleep. Being a music lover, I have some of my favorite music playing on my audio system as I fold clothes that I didn’t get around to folding yesterday. I gather each of Kate’s tops, pants, robes, and socks and put them in their appropriate places. I return to the kitchen where yesterday I had carefully placed her underwear on a towel to dry. Now I fold them and put them in the drawer where historically Kate has kept them. Now they could make their way to almost any other place in the house. I place them neatly in the drawer even though I know they won’t stay that way long. As I do this, I think about the fact that I didn’t even know how to run the washer just a few years ago. I think about my dad who cared for my mom who had dementia. He must have been doing these same kind of things for her though I never heard him say a word about it. I was with them almost every day, and I never imagined the things he was doing. He did it because he loved her. They met in the ninth grade and were together until Mom died at 87. I also think about the other caregivers who right now are doing similar things for their loved ones. They, too, do it out of love. I know. I feel the same way. I am glad I can do it. What a nice morning. When my dad was caring for my mother who had dementia, I tried to get to get him to use a sitter when he needed to get out. He was always resistant, but he finally agreed to a short trial to see how he liked it. He didn’t like it and didn’t stick with it long enough to become comfortable with the arrangement. Now that I have had a sitter for Kate almost six months, I have a better understanding of his feelings. That doesn’t mean that I am going to give up the sitter. It only means that I have not fully adapted to it just yet. Having cared for Kate for the past seven years, it is not easy to turn over some of that responsibility to someone else. Kate seems to have adapted much more easily than I have. Despite that, I feel a slight uneasiness just before the sitter arrives. I begin to wonder if Kate will be as accepting this time as in the past. That has not been a problem. The past two times, however, she has not been as enthusiastic as she has been before. Thus, I wasn’t as comfortable when I left her today. Typically, when I leave, I tell her that I am going to the Y and will see her later. She usually says, “What am I going to do?” My answer is that she and the sitter can do whatever they like. I suggest that she could work outside, go to Panera, or stay inside and work on her jigsaw puzzles on her iPad. Until today, she has jumped at the mention of Panera. Today, she just took a seat with her iPad. When I returned home four hours later, that is where she was, still working her jigsaw puzzles. After the sitter left, she looked bored. That didn’t surprise me. I would have been bored if I had been working jigsaw puzzles for four hours. It does, however, play into my apprehension about leaving her with a sitter. She often thanks the sitter and tells her goodbye when she leaves. She didn’t do that today. I think I’ll approach this the way I do most things that come up. I’ll wait to see if this was just a bad day for Kate. Maybe when the sitter comes on Monday, she will be in a different frame of mind. Regardless, I am sure I will be uneasy when Monday arrives. Kate has been with the sitter this afternoon while I went to the Y and ran a couple of errands. When I returned, I discovered that they had not been to Panera, something they almost always do when I am gone. When I expressed my surprise, Kate said, “We could go now.” I asked if she would like that. She said she would. While I was putting my gym clothes in the laundry basket, she went to her room. She met me in the family room in a few minutes. She was carrying an extra top and a pair of shoes although she was already wearing a top and shoes. I didn’t say anything. I wanted to see if she planned to take them with her to Panera. As I turned out, she did. When we arrived at here, she left the extra pair of shoes in the car, but she brought her top in with her. She tossed it on top of the table where she and I are seated. That’s just one more thing I can’t explain. I wonder how many other caregivers have had a similar experience. I suspect a lot. The other day I read a tweet by Ian Kremer noting the importance of having a team to aid the caregiver and the person with dementia. I asked myself, “Do I have a team?” It didn’t take me long to answer affirmatively; however, the members of our team don’t know they are on it. Let me explain. In the typical usage of the term, a team suggests a number of people who work or play together to achieve a common goal. If we begin with this concept of a team, I think most caregivers would have to say they don’t have one. I certainly don’t. In fact, one of the most significant problems experienced by many caregivers is social isolation. I don’t believe it is because people don’t care. I think they are just unsure of what to do for people with Alzheimer’s and their caregivers. I have read a number of things that point to the need to give others a better understanding of how they can help, but I believe this is a long-term solution. Caregivers need something right now. My own approach has been to take the initiative to engage others in helping rather than waiting for them to take the first step. Some of this has come about by asking directly. For example, on numerous occasions I have invited different friends to have lunch with us. Some of these have been members of the Sunday school class that I taught for ten years. I had already been in touch with them by phone and in class for years. It was only natural. I knew that they wanted to maintain some contact and also that it would be good for Kate. We have several very good friends who live in Nashville, especially Kate’s friend, Ellen, who moved there following a stroke. We have paid more visits to those other friends than we might have done otherwise. None of these people would think that they are doing anything special to help us, but they are. Some of these visits occur right here in town. Two days ago, for example, a childhood friend and his wife from West Palm Beach drove over from Gatlinburg where they have a condo. They come to Tennessee about four times a year. Almost every time they come, we get together either in or near Gatlinburg or in Knoxville. We always have a good time, and they have been very supportive since learning about Kate’s diagnosis. There are many more members of our team in just about every place that we go. These include all the servers at the places we eat, the other customers at Panera or other places. That happened at lunch today. As we were leaving, I heard someone call my name. It turned out to be someone we know from church and my Rotary club. We stopped and chatted about fifteen minutes before moving on. He wouldn’t think of his having done something to lift our spirits, but just engaging in conversation did the trick. Because Knoxville is not a large city, we have these kind of experiences wherever we go. Finally, I would say that when I decided to be more public about Kate’s Alzheimer’s, that served as an implicit invitation for people to ask how she is doing and how I am doing. Thus, when I see people without Kate’s being along, I find myself telling them how things are going. All of the volunteer activities in which I have participated have also generated additional support for me. Of course, those activities are fewer now, but they have been significant. I shouldn’t overlook the power of a team of people with whom I communicate via email. I have two college friends with whom I exchange as many as fifty emails a day. The longevity of this connection and the variety of interests we explore have been invaluable. 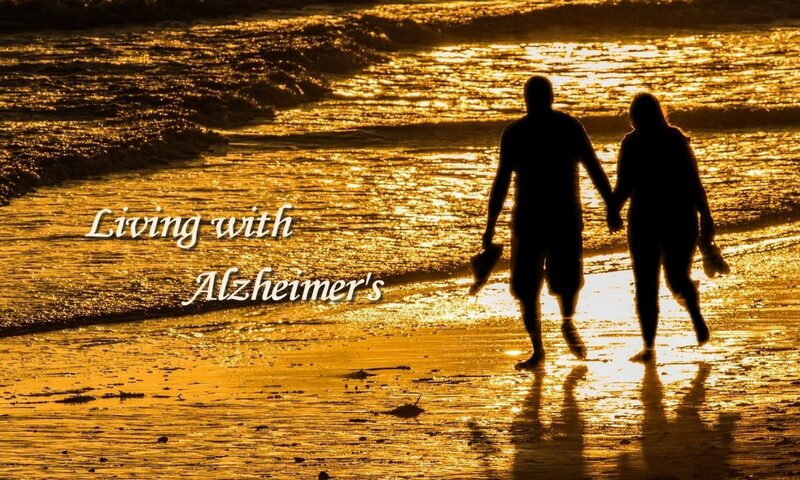 In addition, I have established contacts with a few friends and family who have their own personal experiences with Alzheimer’s. Those relationships provide communications that deal more specifically with issues related to dementia and caregiving. I almost forgot to acknowledge the team of professionals who are more obvious members of our team. They would include Kate’s doctor and dentist as well as the sitters who are here at home with Kate three afternoons a week. Except for the exception of these professionals, none of the people I mentioned would think they are part of a care team working to make our lives better. But that is just what they are doing. They have been important sources of encouragement and support without having to make any special commitment to visit us, to send food or cards, or anything other than relating to us when we meet. It is easy for them, and it is easy for us. Best of all, it works. Yes, we really do have a team of people working to make our lives better. They just don’t know that is what they are doing or how important they are. I am grateful for their presence in our lives. Could she be forgetting my name? After we ordered our lunch today, Kate looked across the table at me and asked, “What is your name?” I misunderstood her and thought she said “her name.” She said, “No, your name.” I made some lighthearted comment, and she said, “No, seriously, what is your name?” I said, “Richard,” and she said, “Creighton.” Then she asked if I had another name, and I gave her my middle name. This is the second time in the past few weeks that she has asked my name. In each case, I first thought she was just playing games with me. My second thought was, “Could she really be forgetting my name?” Today it seemed clear that she might be doing just that. I do know that when we were in the waiting room of her dentist’s office this morning that she asked, “What are we doing here?” I explained that she was there to see her dentist. She said, “I don’t even remember who she is?” I also know that I had to wake her up at 10:00 to get her ready for her appointment and that she was quite groggy when she got up. I know, of course, that there will be a time when she forgets my name and then forgets who I am. I am already witnessing that happen to close family members. I just hadn’t thought we could be approaching the time when her forgetting would include me. I’m not ready for this. Last week at Casa Bella, one of the couples with whom we shared a table invited us to join them for dinner last night. They are originally from Ohio where they graduated from Kent State. They lived in Buffalo for several years as well as Fort Worth. That gave us a variety of similar experiences to talk about. We fly into Buffalo every year when we go to Chautauqua and Niagara-on-the-Lake. Since Kate grew up in Fort Worth, and we met at TCU, that gave us more common experiences. I was not at all surprised that Kate did not remember them when I told her we were meeting them for dinner. On the whole, she got along quite well although she said a number of things that may have seemed strange to them. Very early in the conversation, they brought up something about the time they lived in Fort Worth. Only moments later she started to tell them she was from Fort Worth. She stopped when I looked at her. She must have thought I was going to contradict her in some way and gave me a funny look. Then she couldn’t remember what she was going to say. I stepped in and said something about their having lived in Fort Worth. She looked surprised. A little later, the wife asked Kate where her children live. She couldn’t remember and looked at me. I jumped in and told her and told them about the grandchildren as well. I am sure they both wondered why Kate didn’t answer for herself. At one point in our conversation, she brought up her cousin who lived in Alaska. Her timing was off, but she had said this in response to the mention of an Alaskan cruise the couple had mentioned earlier. Before we left the house, Kate did something else that was strange. We had a warmer day yesterday, so Kate didn’t need to take a sweater or jacket with her, but she did. In addition, she brought a pair of socks even though she was already wearing socks. Even more surprising is that she took the pair of socks into the restaurant and put them on the table beside her fork. I am not sure our friends noticed, but if they did, I am sure they wondered why she had done this. The only explanation I could have given was Alzheimer’s. It was a short day for Kate. She didn’t get up until after 11:30. We didn’t get to lunch until after 12:30, and the sitter met us at Panera at 1:00. When I returned just before 5:00, she asked me what she could do. I told her it was about time to think about dinner but that we could stop by Panera if she wanted. She did, and we were there about 15 minutes before heading to meet our friends at the restaurant. This was the first time I have sensed that she might have been getting bored just being at home with the sitter. It is another indication of how much she likes to get out of the house. I still hope that our spring-like weather will get her out in the yard again.